This is an artist's concept of a human landing system and its crew on the lunar surface. NASA is officially looking for ideas from private companies to develop future lunar technologies, with responses due by the end of next month. In addition, the agency published its methodology for bringing crewed missions back to the lunar surface. In a statement published Feb. 7, NASA laid out how it will work with U.S. companies to develop reusable systems through which astronauts could return to the moon by 2028. Using current and anticipated technologies, NASA will work to complete the mandate laid out by the presidential administration's Space Policy Directive 1 "as quickly as possible," agency officials said. The partnerships would be multiphased and perhaps include collaboration with other nations to "advance our missions to farther destinations, such as Mars, with America leading the way," NASA Administrator Jim Bridenstine, said in the statement. Technology already operating within low-Earth orbit will serve as a springboard for the development of the reusable lunar systems, Bridenstine said. One important element in NASA's approach is the establishment of a gateway that could support round-trip lunar journeys. 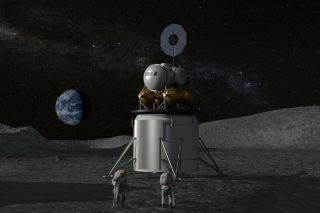 This would allow "the first building blocks for fully reusable lunar landers … to be refueled by cargo ships carrying fuel from Earth to the Gateway," agency officials said. But that would be just the start. Going forward, the fuel might come from the moon itself. Part of the project is to find methods of making rocket propellant with water ice and regolith (lunar dust) from the moon in a process known as in-situ resource utilization (ISRU). The formal request for proposals that NASA published on Feb. 7 is part of Appendix E to the second Next Space Technologies for Exploration Partnerships (NextSTEP-2) Broad Agency Announcement. In this request, NASA aims to fund flight demonstrations of lunar landers made for astronauts by private companies that would perform critical research and support risk-reduction activities. March 25 is the deadline for responses.